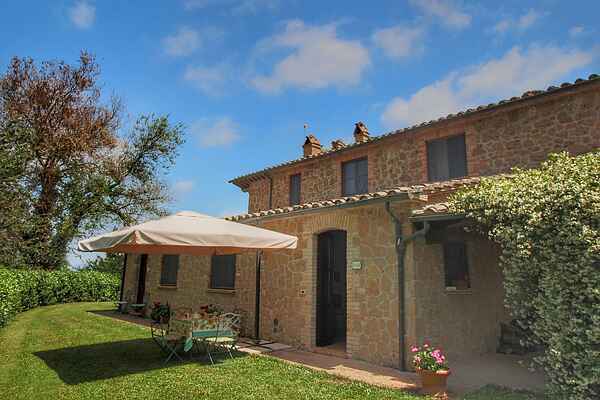 In a hilly region in the Tuscia area, the land of the old Etruscans, there is a rustic agriturismo with 4 apartments and a swimming pool. It lies on a hill at 420 meters altitude with a beautiful view of the surroundings. Because of the altitude and the mild climate, the summers are very pleasant with a nice sun and a breeze. It is a typical, rustic farmhouse that has been completely renovated with modern amenities. The agricultural company is engaged in the cultivation of wheat, sunflowers and corn and there are cows that you can see grazing in the valley. The agriturismo is surrounded by a large garden with plants and flowers. It is an ideal, quiet place for a holiday in contact with nature. Perhaps you will wake up to the chirping of birds and the sound of crickets. Near the house is the panoramic swimming pool and sun terrace with views over the Paglia river and the surrounding hills. In the neighborhood is a riding school, tennis court and football field. The homeowner can give more information about this. There are several good restaurants in the neighborhood: LA DOGANA, 141 km via Cassia, località Centeno, Proceno ENOTECA DEL CASTELLO, Corso Regina Margherita, Proceno IL Beccofino via Cassia, 28 Acquapendente IL BORGO, through Porta S. Angelo, 3 Acquapendente TRATTORIA TOSCANA, Piazza N. Sauro Acquapendente LA RIPA, Cesare Battisti, 61 Acquapendente In the town of Proceno, you can taste and buy at "Roberto" cheeses and hams. The homeowner can explain where this store is.